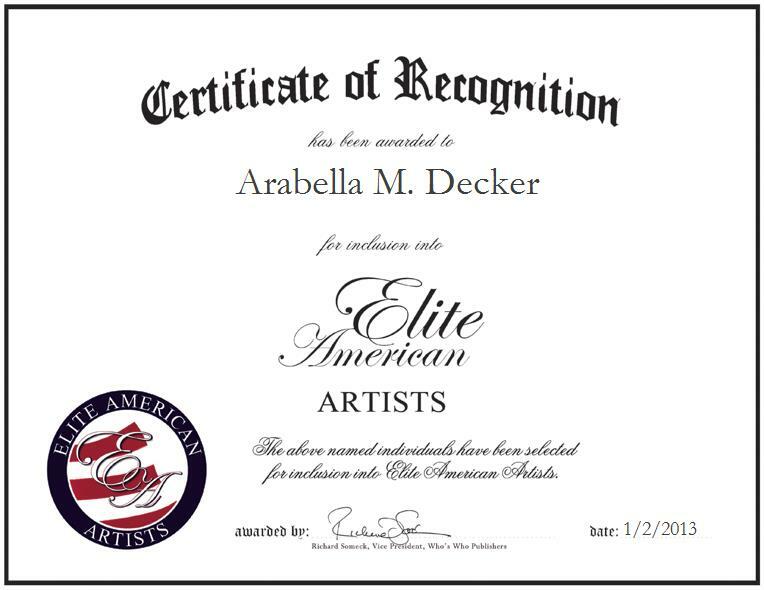 LAKE WALES, FL, January 2, 2013, Arabella M. Decker, Artist at Dragon’s Lair, has been recognized by Elite American Artists for dedication, achievements, and leadership in the fine arts. Ms. Decker is an award-winning artist that has showcased her work around the nation over the years. With more than 42 years of professional experience under her belt, Ms. Decker continuously strives for excellence in her every endeavor. She was inducted in to the Coastside Women’s Hall of Fame in the Half Moon Bay Review in 1999, and published in Israel’s “Begging with Assistant -The Unseen Men,” “Art on the Net: Internet Now” magazine in 1997. She has also been published in U.S. Post Office Philatelic Magazine, Art and Pumpkin Festival Cachet, and in “Art Seen” PBS Invitational Program Interviews. Ms. Decker participated in “Project Muse” through Museums Uniting with Schools In Education and the Harvard Graduate School of Education. She has had her work featured in Gallery 25-Art Share, “The Winter Show” at San Carlos in December of 2005. Additionally, her work has been featured at The Works Gallery in San Jose, at a duo exhibition with Gaylon Arrigotti at the Quarry Cove Gallery in Pacifica, and at a solo exhibition at the Coastal Arts League at Half Moon Bay in 2000 and in 2004. She has had her work featured at the Peninsula Gallery at the San Mateo County Arts Council, at the Corridor Gallery through the Peninsula Art Association of Redwood City, and in a solo exhibition at Gallery 92 West in Half Moon Bay. In addition to these galleries, Ms. Decker has had her artwork showcased in solo exhibitions at the San Mateo Arts Council in Belmont and at the Spanishtown Gallery in Half Moon Bay. Her work has also been featured at the Art is T Gallery, the Peggy Eriksen Gallery, and the Ed Lesser Gallery. An innate passion for painting led Ms. Decker down a path to success as an artist, and in the years to come, she plans to continue organizing more art exhibitions.